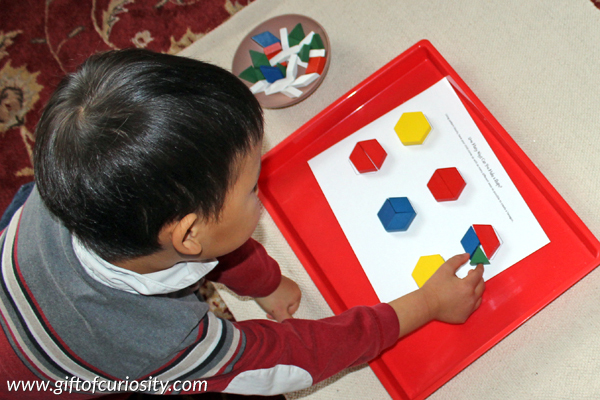 Shapes activity: How many ways can you make a shape? We’ve been playing with shapes quite a bit in recent weeks. I’ve been giving my kids all sorts of different and playful shapes activities to help them engage, explore, and build with shapes. In this post I’m sharing a free shapes printable and accompanying shapes activity we did to look at all the different ways to make a shape. Note: For more ideas to help kids learn their shapes, see my Teaching Shapes to Kids page. 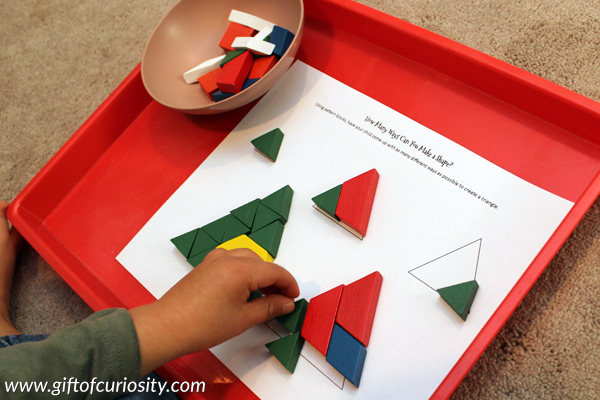 For this activity created three printable worksheets for use with pattern blocks. We own and use the wooden pattern blocks from Learning Resources . That being said, other pattern blocks would work as well, so long as the dimensions are the same. I believe there are multiple sets out there with similar dimensions, including sets from Melissa & Doug , School Smart , and these plastic ones from Learning Resources . I created three different worksheets: one each for squares, triangles, and hexagons. The idea is for kids to use the pattern blocks to fill in the shapes in as many different ways as possible. Because squares are the only shape with right angles in the pattern block set, the squares worksheet is the most basic. 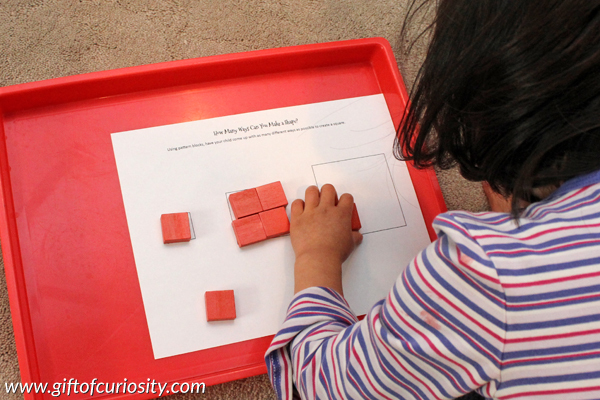 Kids simply use one or more squares to create three squares of different sizes. On the triangle worksheet, kids can get more creative. In fact, I was extremely impressed with QBoy’s creativity in using a variety of shapes to create triangles of different sizes. 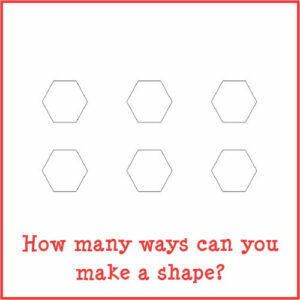 The hexagon worksheet includes six different hexagons, all of the same size. QBoy came up with several different ideas for filling in the hexagons. 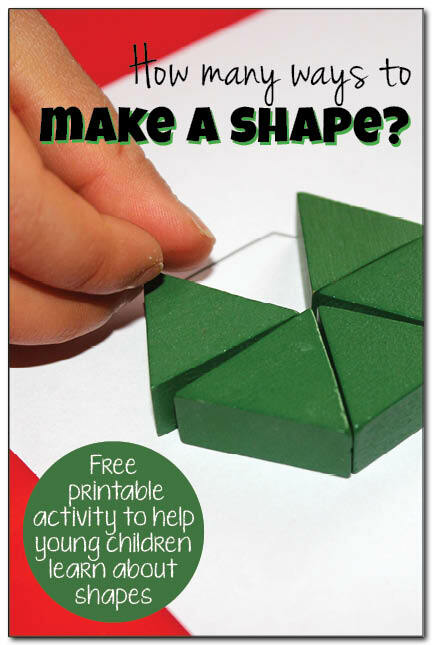 Want a copy of my How Many Ways Can You Make a Shape printable? How many ways can you make a shape? For more ideas and free printables to help kids learn shapes, see my Teaching Shapes to Kids page and my Learning Shapes Pinterest Board. My daughter would love this! Thank you so much for sharing at the Kids Learning Printables Linky Party. My students just love working with these pattern blocks! Thanks for sharing at After School! Great printable! Thanks for sharing at After School Link Up! Thank you! My Scholars will enjoy this! I am so grateful that you are sharing. Saves me much time. I wish you peace.